Sometimes, knowing the rules of the road can be a challenge. We’re a mobile culture but road-use laws change as you cross state lines. I was reminded that knowing where to cycle on a road can be a barrier to mode-shift efforts here in Minnesota while talking with my intern, Sean. To help puzzle out the laws in Minnesota, Sean wrote this piece about being a cyclist. What have your experiences been on the road? A bicycle is kind of a difficult creature on the road: not quite a vehicle, not quite a pedestrian. This balance can lead to a lot of confusion for all users of the road when it comes to understanding proper right-of-way. The basic principle is that a bike is a vehicle, and generally the movement rules applicable to cars are applicable to the bike. However, there are a lot of areas where a bike differs. The first difference is that Minnesota law distinguishes between sidewalk and street riding. A sidewalk cyclist is considered a pedestrian, and has right-of-way over motor vehicles in a crosswalk. As a pedestrian, a sidewalk cyclist is not required to stop at stop signs and is bound by the pedestrian walk/don’t walk signals at traffic lights, rather than the vehicle signals. Most bike folks know that sidewalk cycling is problematic. In urban areas, it can be dangerous and disrespectful for pedestrians. In fact, it’s against city ordinance to ride on the sidewalk in most business districts in Minneapolis, including Lake Street, Uptown, Downtown, and near the University. Even in suburban areas, however, sidewalk cycling increases your risk of crashes, because it makes you substantially less visible to drivers. However, even a bicyclist who never rides on the sidewalk may run into this legal area. For example, the Midtown Greenway has many on-grade crossings (most notably near Hiawatha Ave). At these locations, bicycles are considered pedestrians and have right of way. Bear in mind that while you may not be subject to a stop sign as a pedestrian-cyclist, you should consider the sign’s intent: if you’re being as a pedestrian, you should be cycling in a way that is reasonably consistent with ped speed. Don’t go into a crosswalk at 20 mph if you expect cars to be able to react appropriately. 1. At 2-way stops, yield to pedestrians and cross traffic. Make sure the way is clear before riding into the intersection. 2. At all-way stops, yield to pedestrians and then be prepared to take turns with vehicles. Drivers may become unsure in this situation. 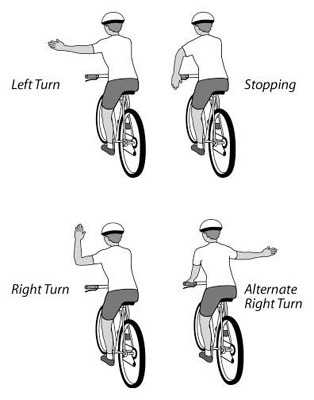 They may offer you a hand signal to proceed — or, you should be prepared to offer them one. Note that you are not required to use the pedestrian push signal (though, if there is too much cross traffic to run the light, this may still be your safest option). This is technically an affirmative defense — which means you might still get a ticket for it, but if you can show that you followed the requirements of the Unchanging Light law, the ticket will be dismissed. Okay. So while I’ve talked a lot about interactions with motor vehicles, I should say a few words about pedestrians. Pedestrians have right-of-way over vehicles (including bikes) at all crosswalks and all unsignalized intersections. Pedestrian right-of-way at unmarked crosswalks is routinely ignored by vehicles, but like drivers, you could get a ticket for violating it. Be a good example to our car-driving brothers and sisters and stop. Also, remember that on shared-use paths — or on the sidewalk — pedestrians have right-of-way over cyclists using the facility. Be respectful and give them their due space. What have you experienced while riding in other cities or countries? Are there laws that you appreciated in those locations that you’d like to see implemented here? Were there problematic laws or rules that you think we should avoid? Well put. Thanks for writing this. I'd love to see some consistency in laws and regulations.